Pop Culture Safari! 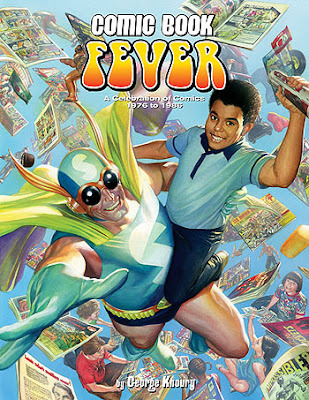 : Interview: George Khoury's "Comic Book Fever"
Interview: George Khoury's "Comic Book Fever"
George Khoury's "Comic Book Fever" is a picture-packed nostalgia fest for anyone who grew up reading comics in the 1970s and 80s. It includes features on favorite comics artists (George Perez, John Byrne, Frank Miller) and titles (Teen Titans, X-Men, Love and Rockets), even favorite ads (Slurpees, Hostess Twinkies). If you ever contemplated selling Grit door to door, this is a book for you. My review will appear on Wink Books later this week. In the meantime, I thought it would be fun to interview George about the book, his inspiration for it and how he set about putting it together. I wanted to go back to the era that made me a comic book lover. I wanted to revisit all the comics and comic book creators that defined my favorite period, my generation, my friends and me. And, I wanted to make this reading experience feel as authentic as possible by capturing the pop culture and flavor of this era. What made you believe it would work as a topic and collection? All the stories within Fever show how comics went from being a medium for kids into something more accepted by the mainstream – and all of that happened in the 1976-1986 period. We witness this beautiful transformation right before our eyes in the pages of this tome. What went into your decision-making regarding what to focus on and include in the book? It was a desire to capture everything that would allow me to tell this story in the way it needed to be told. I wanted to cover the people, places, characters, titles, and moments that inspired us in this key transitional period of comics. Your love for this period of comics comes through loud and clear throughout the book. What do you think made being a comics fan during this period special, as opposed to periods before or after? Hearing from your readers, what are some of the things they liked most about the book? What sort of memories did it trigger for them? The great thing about Fever is that everyone has a different reaction to it. Everyone has a different favorite segment and no two responses have been alike. It’s just fun to have a book that works on so many different levels. In a way, your book captures the end of something - the period when comics vanished from most newsstands and corner markets and went to the direct market - specialty comic book shops. The 1976-1986 generation was the last, really, to grow up with comic books as a universal part of childhood. They became a hobby and subculture. What do you think was present in the world of comics from 1976 to 1986 that we're missing today? I miss the innocence and the spontaneity of comics. I miss the days of seeing comics sold everywhere: grocery stores, drug stores, candy stores, etc. I miss those days when friends shared their passion for comics by having actual face-to-face discussions about their favorite titles. Also, I find it sad that lost in the current commercialism of comics are kids. When I was growing up, every kid had a stack of funnybooks in their house. This is not the case today. Anything better about the comic book world today as opposed to the period covered in your book? Accessibility. Pretty much all the best comics ever published have been collected in trade paperbacks and hardcovers now. Back in the day, that wasn’t the case since the reprinting of older material wasn’t the norm yet. It was a real ordeal trying to find old back issues and classics then. What can younger fans take away from your book? If they want to see how comics became a pop culture juggernaut, Comic Book Fever is the place to start. Have you heard from younger readers? Yes. I wrote this book for everyone - the longtime fans and uninitiated. It was always my goal to make a tome that could be shared with our children and friends from all generations. It's an open invitation to the world of comics. What is the response to the book? The response has been beyond my wildest dreams. It's been very encouraging because I wasn't sure if the book would click with anyone outside of myself. It makes me feel like the five years I put into it were worth it. Do you have any future book projects planned? In terms of future books and articles about comics, I have nothing on the horizon. No offers, no nothing. After twenty years of covering comics (in various books and articles), it looks like I've sadly reached the end. Honestly, I couldn't think of a more cheerful note to end on because I put everything I had into Comic Book Fever. It's my love letter to comics. "Comic Book Fever" is available from TwoMorrows Publishing. Thanks for the interview, John!